(Stillness in the Storm Editor) The universe appears to be sympathetic in nature; meaning it functions in waveforms—at all levels. And this is true for us and our experiences on the physical plane. Reality is structured in harmonic scales all throughout the cosmos and this works both materially and consciously. Music is a perfect blend of logical, rational processes and intuitive creative expression. The Universe (you and I verse, or song) is also a perfect harmony of oneness. Therefore, we can look to music in order to understand much about ourselves and the cosmos. 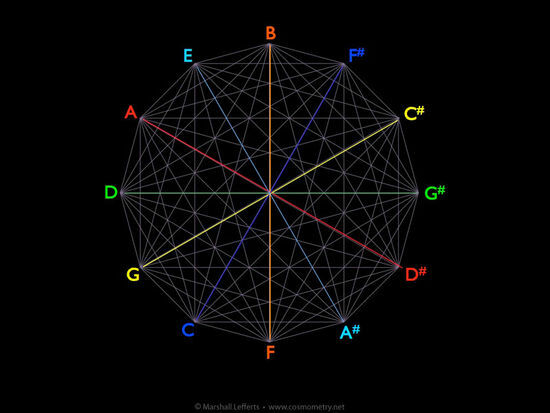 This is called the “chromatic” scale — 12 equal-interval steps up the scale (called “half steps”). As you can see, there are seven letters (A B C D E F G) and five sharps and flats (i.e. A#/Bb). The seven letters comprise the 7-note “diatonic scale” we’re all familiar with as “do, re, mi, fa, sol, la, ti…do.” In the key of C, these are C D E F G A B…C (the ending C is the beginning of the next “octave” wherein the pattern repeats at double the pitch (frequency) of the previous scale). This 7-tone scale consists of a combination of whole steps (two-note intervals) and half steps (one-note intervals) along the 12-tone chromatic scale. This 7-tone pattern is the same in all twelve keys. Music is a system of relationships, these being the harmonic intervals between notes and the combination of these intervals to create melodies and harmonies. One of the primary interval relationships is called the tri-tone due to it being an interval of two notes that are 3 whole steps apart. Given that 3 whole steps is equal to 6 half steps, we find that these two notes exactly divide the 12-tone scale in half. As such, they can be seen as two primary “opposite” notes. In fact, the tri-tone interval, when sung or played on an instrument, is perhaps the most unresolved harmonic relationship in all of music. It is full of tension and dissonance, and yet is it present in almost every piece of music composed. Being that the tri-tone consists of two opposite notes in the 12-tone system, it’s obvious then that there would be six pairs of these tri-tone intervals. These are colored coded in the diagram below as A/D#, A#/E, B/F, C/F#, C#/G, D/G#. Note for later that the color coding is intentionally spectral as such: A, B, C#, D, E, F#, G# . These are the seven notes of the major scale in the key of A. 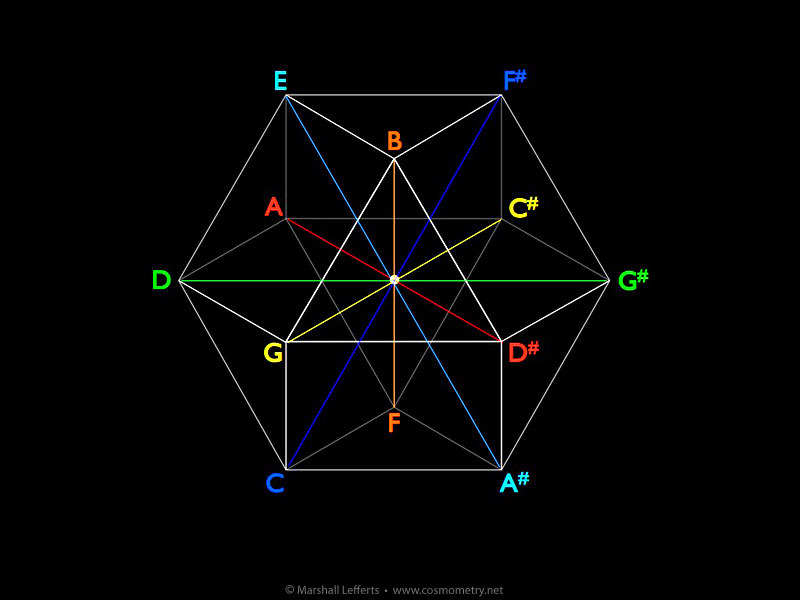 Another very basic harmonic relationship is called the fifth. Simply, it’s the interval between the first and fifth notes of a major scale. For example, in the key of A the fifth note is E (A=1, B=2, C#=3, D=4, E=5, etc). 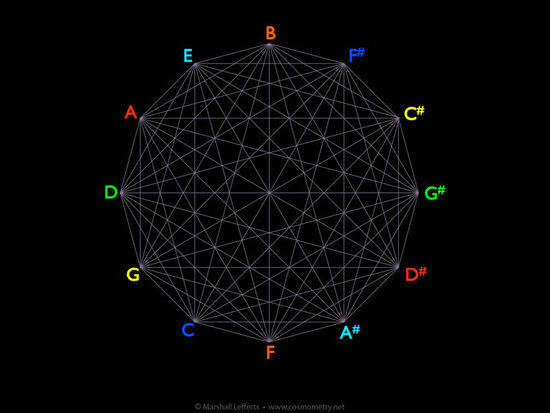 This interval is so primary and profound in music it is actually called the “perfect fifth.” In the world of classical music theory, one of the ways to show fundamental relationships is to array the 12 notes around a circle following a sequence of fifths, as in the illustration below. 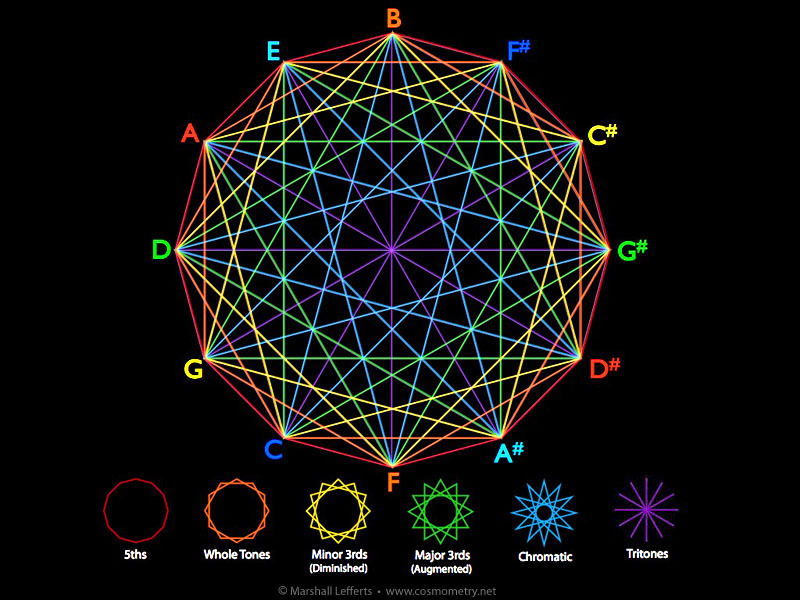 This shows that there is a progression in music that naturally moves or cycles through all 12 keys in a way that is harmonically pleasing to our senses (it is also referred to as the cycle of fifths). 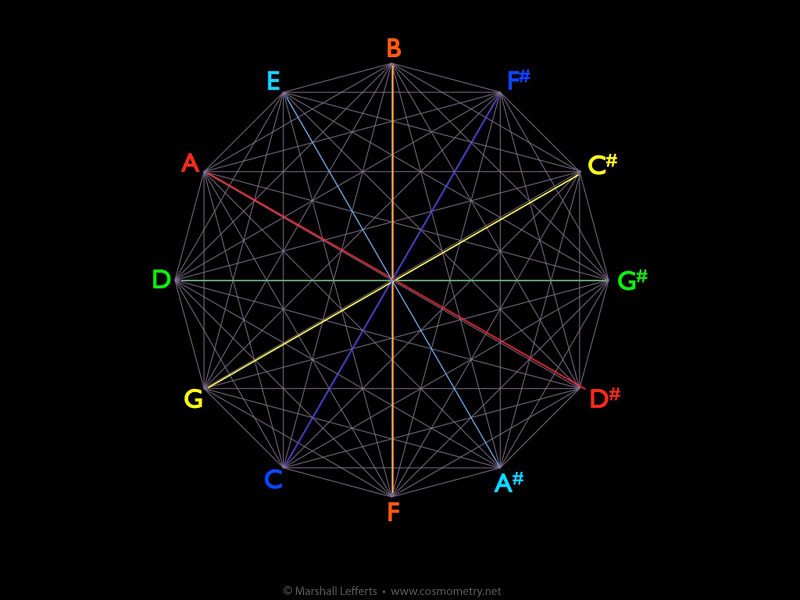 The same holds true when the 12-tone system is arrayed chromatically around the circle. 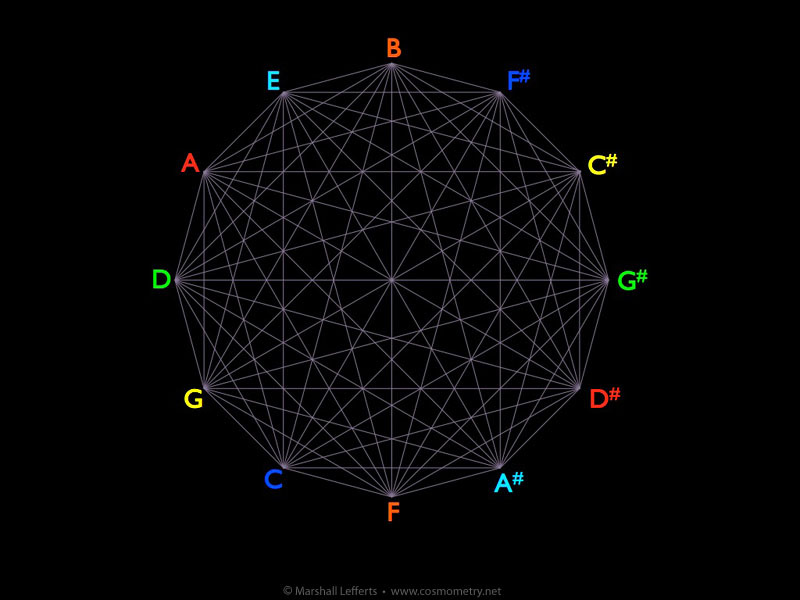 In this way we can easily see the six pairs of opposite notes that comprise the basic 12-tone system of music. Buckminster Fuller stated that the vector equilibrium is comprised of six-pairs of equal and opposite vectors radiating from its center point. The music system aligns with that model conceptually, though of course the frequency differences of the actual tri-tone notes are not equal. Note that the color-coding of these polygons is not coordinated with the above color-coding but is simply to make them easier to see in this illustration. Next… we’ll explore a fundamental aspect of the music system in The Tri-Tone Duality of Music. This article was first shared on Stillness in the Storm in January 2014. The point of full transition is very close. Our entire journey leading to this unique moment has been a process of deep exploration to discover who we really are. Earth School wasn’t designed to be passed easily, and is one of the fastest places in the Universal Matrix to progress on a soul level. Grading time approaches. Everyone reading this, everyone, has a vital role in the ascension process here. Over 7,000,000,000 people populate this planet at varying degrees of awareness. Every single one is a piece of the illuminated puzzle. Things may seem to be getting pretty lively out there at the moment, and the 4d matrix energies force the old patterns of imbalance to correct themselves. No matter how things may seem, we have pulled it off. Ascension is guaranteed for us and our beautiful world. Remember to let the breath within your physical being continue to flow, and stay grounded into the spirit of Gaia. Three energies have combined at request to provide great peace and illumination at this time, when invoked, every molecule of your being will glow with the light of Source. These are the Higher Mahatma energies, the Aquarian Ascension energies, and the Gold Ray of Christ. Here is an invocation I have created to allow easy flow of these beautiful frequencies. I ‘name’ choose to accept and integrate a full illumination of The Aquarian Ascension Energies, the Higher Mahatma, and the Gold Ray of Christ into my expanded four body system. I AM a Walking Master. I allow the full, balanced presence of my Highest Self here on Earth, to embrace my pathway to Source. your mind for a t.v. about balance and your safety.